This text was originally posted by Marc at With Great Power and is reposted here with new images. Check out With Great Power for more of his reviews! This is Marc’s first review for TRO and our 50th! Milestone! What if Superman’s rocket had landed on a farm in the Ukraine rather than one in Smallville, Kansas? What if he had been raised not in the spirit of “truth, justice, and the American way,” but had been molded instead into the poster child of communist Russia? 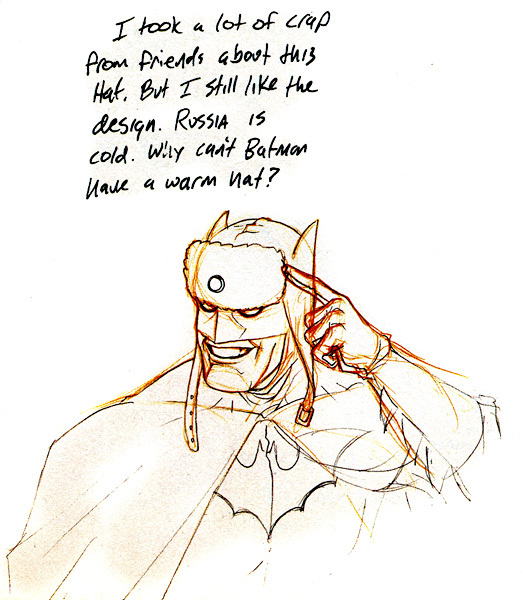 These are the questions writer Mark Millar seeks to answer in Superman: Red Son, and with the help of artists Dave Johnson and Kilian Plunkett, he pulls it off tremendously. Millar’s first success in this book is that he doesn’t take the story in the direction you would probably expect based on the premise alone. This isn’t some super-patriotic, down-with-communism propaganda piece in the vein of Red Dawn or any of its brainless ilk. Instead, Millar uses Superman’s eventual role as leader of the Soviet Union as a platform from which to explore an even more basic question than the ones that opened this review: what would Superman do if he ruled the world? Tying into that question, of course, is the issue of whether or not Superman should rule the world – something the character struggles with throughout the book. He’s not a villain, at least not in his own view and not from the story’s perspective. In fact, he initially has the same unselfish, non-political goals that Superman does in the main DC universe. In his mission to achieve world peace, though, he becomes what amounts to a world dictator, even going so far as to have his dissenters essentially lobotomized. The road to hell is paved with good intentions, as the saying goes, and that’s certainly where the world has gone by the end of the book. 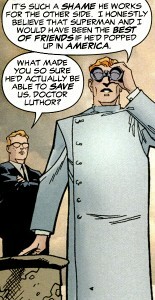 The main character’s role as authoritarian leader results in some interesting inversions of classic DC concepts. In the world of Red Son, Lois Lane is married to Lex Luthor (brilliant inventor and, later, president of the United States), Hal Jordan wields his Green Lantern ring as a military weapon, and Batman is a terrorist trying to subvert Superman’s regime. 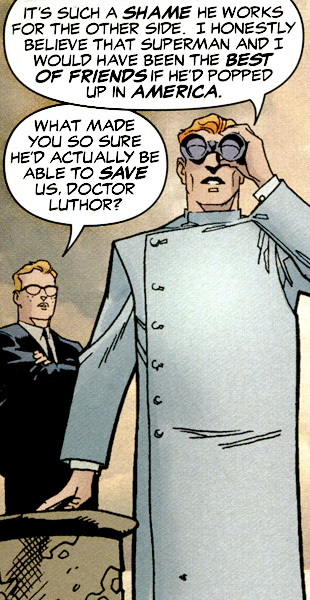 The evolution of Luthor’s character is particularly interesting, and it begs the question: what kind of man could he have been in this reality if not for Superman’s existence? The fact that there are significant differences from regular DC continuity doesn’t come as a huge surprise, in and of itself. Admittedly, there’s a bit of that in Red Son – in one scene depicting a Daily Planet office party, for example, we’re treated to some embarrassingly “hey kids, look at me!” appearances by Oliver Queen and Iris Allen. Millar keeps those kinds of moments to a minimum for the most part, though, and his focus is less on making a spectacle of the tweaks he’s made to ordinary continuity than it is on giving his universe the room to live and breathe in its own right. 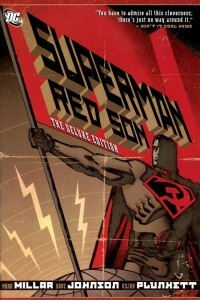 But as good as the main story is in Red Son, the book’s ending is what really blew me out of the water. To compare the book (once more) to the vast majority of Elseworlds titles, this one doesn’t simply pack up and go home once it’s used up all its tricks, leaving us to wonder what happens to the characters after the story ends. Instead, Millar closes with one of the most intelligent and self-reflexive surprises I’ve ever seen at the end of a superhero comic, one that’s sure to bring a wide smile to new and long-time readers of Superman alike. The art in this book is quite good, and the best way I can think of to describe it is as a mash-up of sorts between Paco Medina and early Leinil Yu. Penciling duties are handed over about halfway through the book from Johnson to Plunkett, neither of whom I was familiar with prior to reading this book. I’m not sure of the specific reasons for the change, although some handwritten comments on one of the bonus sketch pages at the end of the book lead me to believe that it has something to do with Johnson being a fairly slow artist. It isn’t a detriment to the book, though; in fact, the shift is so seamless that if you weren’t paying attention, you might not even notice. 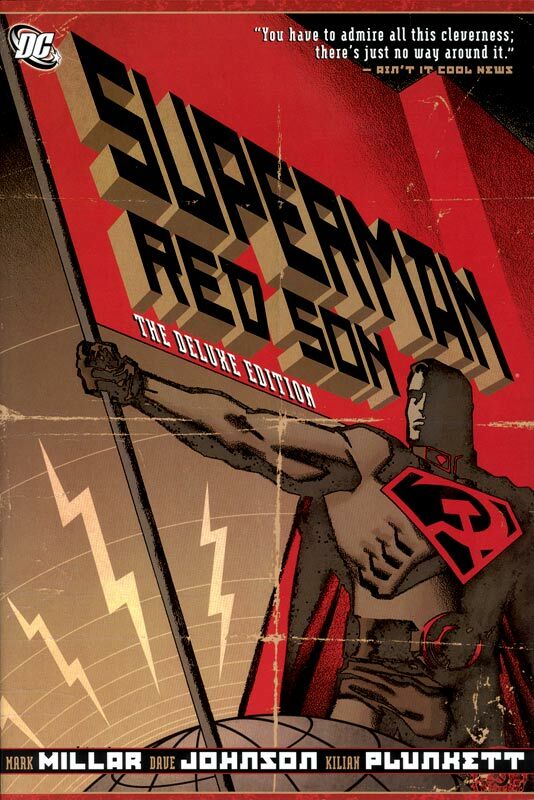 As far as purchasing Red Son (which I heartily recommend doing) goes, the Deluxe Edition is in my opinion the best way to go. The book is of a decent size – it’s three issues long, but each prestige issue is about twice the length of a standard comic book – and, as I mentioned earlier, it has a few pages of sketches and concept designs at the end, including several by Alex Ross. It’s a pretty nice package, overall, which is only befitting of one of the best Superman stories, alternate universe or not, published in the last ten years. 4.5 out of 5. This is probably the best alternate-universe Superman story I’ve ever read, next to All-Star Superman. Being an Elseworlds title, this book takes place outside of normal DC continuity. That being said, this version of Superman apparently does get mixed up in events in the main DC universe later, so it’s not completely non-essential, I suppose. 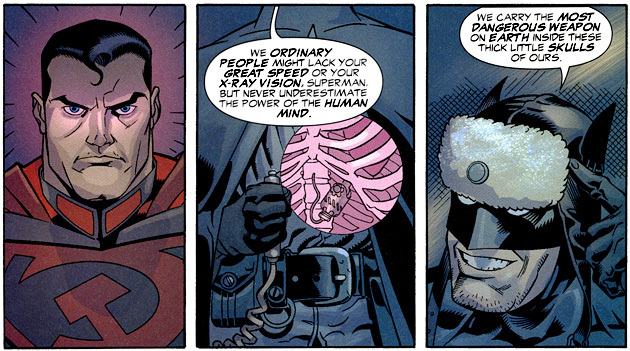 Simply being familiar with the general concept of Superman is all the background you need to enjoy Red Son. If you’d like to read a more traditional version of the character’s origin first, I would highly recommend the one presented in Superman: Birthright; it’s not exactly in current continuity, but it captures the essence of Superman quite well. As I mentioned, though, you don’t need to be able to identify the differences between this story and the main DC universe in order to enjoy the book. If you’re looking for more excellently-written, alternate-universe Superman stories released in the last decade, All-Star Superman is the way to go. The series has been collected in two volumes (paperback or hardcover, your pick), and an Absolute Edition is on the way. 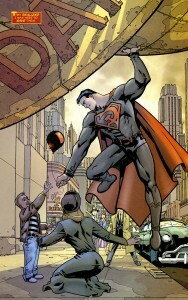 As for the Russian Superman, his next appearances after this book are in Superman/Batman Vol. 4: Vengeance and then Infinite Crisis. Hopefully you like the images I scanned to go with it. As almost an afterthought (though I edited this in up top) this is the 50th review on this site! Whoa, that went fast! I guess it’s not that big a deal – one month of posting daily reviews will give about 30 – but I still feel like it’s something worth celebrating. Don’t know how many of those are DC books off the top of my head, but I feel like we’re making a small ding in that eventual 1800 DC Universe reviews goal. Though those bastards are just gonna keep putting out books while we’re reviewing them, so who knows how many it will be when we’re finally caught up! No problem, Ian, thanks for letting me post it! The pictures you chose are great. And I’m honored to be review #50…though at the rate you’re going, I’m sure #100 will be here much sooner than you expect! I like Superman, that’s out of question, but he was never my favorite super-hero because it occurred to me that he’s sort of an “american idol” – and then I read “Red Son” and it struck me with every page. It’s a genius idea in the “what-if”-universe of comics to ask what would happened if these and those super-characters grew up in totally different environments, especially different political structures like capitalism – communism. Besides the Comrade of Steel himself, I enjoyed the interpretation of the character of The Batman the most – the Dark Knight as a dark terrorist. Read this piece of Elseworld-Art. DO IT! Batman is really great in this book. And I absolutely love his little hat. I love this book, and to echo jonah_X above, the interpretation of Batman is perfect. 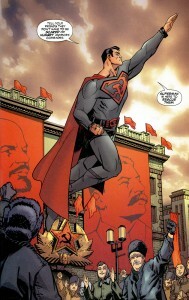 It gave me a little giggle in Final Crisis (“Superman Beyond,” I think) when Morrison brought in the Soviet Superman. Granted (ha! 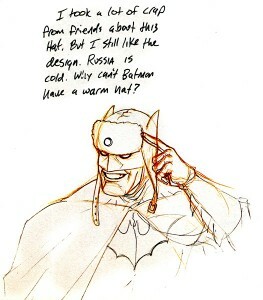 ), Morrison does enjoy his obscure characters, doesn’t he? Back to Red Son, this was my compromise for Superman, because I’m not a huge fan of the Boy Scout. This, however, was a fun “what if?” story, keeping the powers the same but changing his circumstances. I strongly recommend this book to anyone who might not be a big fan of Superman themselves. As for this deluxe edition, I love the cover artwork. Good homage to Soviet propaganda art, a style of which I am a huge fan. And i’m glad reading your article. But want to remark on some general things, The website style is ideal, the articles is really nice : D.
Hi there,I read your blog named “Trade Reading Order » Review: Superman: Red Son” daily.Your humoristic style is witty, keep it up! And you can look our website about proxy server list. 12 Superman Stories Everyone Absolutely Needs To Read | GOORAMA!